I’m here to announce the winners of the April challenges! Please contact us at ablognamedhero@gmail.com so that we can organise your prizes! If you’re a GV winner, please specify in the email/subject line, and if you’re a Heroine, please do the same (let us know in the email body or subject line). it’s Christine. Of course I have a video for you again. This time I’d like to show you a few things that you can do with your cork. I think every supply or material has so many options and we don’t use them often enough. Still this is quite a clean and simple card, right? I love those little details that add some more interest to a card without overloading it. I hope you have a nice weekend – maybe you even find the time to enter a card to our current challenge. The prize is generously sponsored by Simon Says Stamp. Hello everyone, it’s Michelle here today. Today’s post is very bittersweet for me. It is my last post on ABNH. I have thoroughly enjoyed spending the last 2 years on this AMAZING, INCREDIBLE, TALENTED team. These girls have a piece of my heart and I will truly miss them. I will truly miss ALL OF YOU READERS. Your comments, love and involvement are EVERYTHING. Without you this blog would not exist. I encourage you to leave all that love to the amazing new Design Team. They too will love you the way I do. YOU READERS are the BEST in blogland! On that note I have two more cards featuring Freckled Fawn and Hero Arts…. I was so happy to hear the birds chirping 2 days in a row I decided to make this card card with some ink daubers and that FAB bow by Freckled Fawn. It was the longest winter ever…don’t ya think? 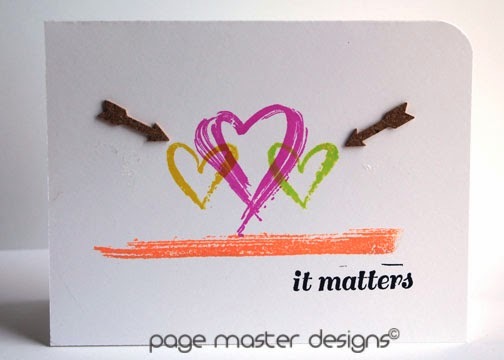 Lastly….love, it matters. It seemed fitting for today. Your love matters. You matter. You have made my life a happier place. Thank you. Be well. Don’t forget to come visit me. Is there anyone (except me) who sees some new product and just HAVE to have it, only to never really use it? When the Distress Stains came out on the market I just had to have some. I got three, used them like once and then they collected dust. I recently went though my stash organizing my inks, mists, and whatnots and came across my stains. When I was trying to figure out a theme for this post I decided to try to come up with different ways to use the stains. I made three cards using some techniques I came up with while messing around. I’m pretty sure I’m not the first to figure this out but I was still happy to get some nice results. The first card I made by just pressing down the dauber firmly and swiping to the side. I made sure to use my heat tool to dry the ink between swipes to prevent the colors to blend too much. I was very happy with this effect. I embossed the greeting with white embossing powder on top of the ink. I also dropped some water on the surface and covered it with gold embossing powder, making sure to heat it up from the backside to prevent it to fly away when the water dried. The next card I made by pressing the dauber firmly along the top of my paper and letting ink run down while angling the paper and blowing on the ink. I also misted some water to make variations in intensity. I kid you not, this was very messy. I flipped the card to get the ink in the bottom. stamped a greeting and embossed it in silver. Pretty! I’m sure everyone who owns Distress Stains has tried this. Just smash down the dauber on the paper, making it splash out in pretty splatter patterns. Fun! I embossed this greeting in black and added a die cut because I liked the contrast of the black. I hope you got some ideas and inspiration. I’m always happy to get to rediscover some old products. This month the returning parts of the team has been sponsored by the amazing Freckled Fawn. I hope you go check them out, they have some lovely products! Don’t forget our current challenge, it’s all about layers. Fun, right? Thank you so much for stopping by, take care! here I’am with my first solo post as a new team member at ABNH. Like the other new gals I’am also very excited. Because of easter I have chosen my theme. For the easter basket I have used the Lifestyle Crafts ‘Berry Container’. To give it more structure I have stamped HAR ‘Five Line Background’ with versamark onto the die cut. Then I’ve embossed it with clear powder. While I have asked myself what more I could show you today, I had a brainstorm. A Flip-Book. I have loved them as I was a child. In my childhood you could buy bubblegum together with a little Flip-Book. I will never forget the smell of the Flip-Books. Here is a little Video for you to see how it works. Thanks for visting my solo post debut. I hope you liked it. Don’t forget our current challenge!